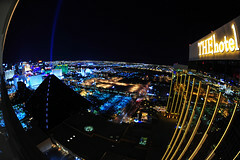 It was mostly for the view that Cowboy and I ascended sixty-four floors of THEhotel at Mandalay Bay after gorging ourselves silly at Aburiya Raku. It was my last night in Sin City and I wanted a cheap thrill. 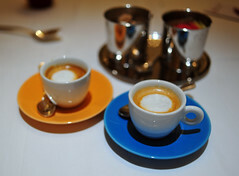 At the top of THEhotel is miX, Michelin mogul Alain Ducasse’s one-starred foothold on The Strip. From there, one can gain a magnificent view of the city. Does Monsieur Ducasse know that he employs a gruff server who overtly sends an icy gust towards diners who arrive at 10 p.m. for dessert? With an hour left before closing on a Monday night during a down-economy, only two tables were occupied when we walked in. Was our business not welcomed? Someone’s got to pay for those 15,000 blown-glass orbs hanging from the two-story ceiling, a giant jellyfish suspended in typical, over-the-top Vegas style. But say what you want about Alain Ducasse, the man’s desserts (at least the ones the miX are able to reproduce) are unimpeachable. 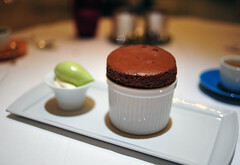 The “Chocolate Souffle” here was a thing of beauty ($10). A cloud of dark chocolate accompanied by a perfectly turned quenelle of pastel-green pistachio ice cream propped on a bed of crispy meringue sticks, the souffle was fluffy yet rich. Textbook. Everything about the Roasted Pineapple dessert was perfect too ($10). ** The strip of pineapple had been roasted until it was caramelized throughout, warm, soft, and sweet. The ice cream was drunk with rum and custardy, mottled throughout with a generous amount of golden raisins. Lined atop the pineapple like sails on a ship, a trio of arlettes were thin, flaky, and crisp. This was a great dessert. Of the three “Ducasse Signature Desserts” on the menu, I ordered the “Baba au Rhum ‘Monte Carlo Style,” for which Ducasse is famous ($12). I love baba. 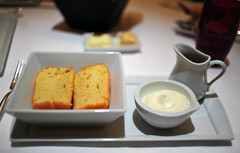 I never had a chance to try Ducasse’s baba at Alain Ducasse New York. And I haven’t been to Benoit, Plaza Athenee, or Louis XV. So, I figure I might as well try it here. The version at miX (which, judging by the name, I assume is presented in the same style as at his restaurant in Monaco) was very good. It came with side of either Captain Morgan or Montecristo rum syrup. I chose the latter. 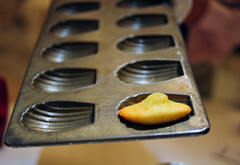 Our double-shot espressos arrived with delicious madeleines, still hot in the baking tray. They were served with a side of Nutella. It being way too hot to eat outside on the terrace, which overlooks the strip, Cowboy and I took a brief break outside after our desserts. The terrace patio is a lot smaller and narrower than I had imagined, enough space for only four or five tables. Lined with a glass-paned railing, acrophobics need not consider. It’s too bad our service wasn’t better. The desserts we were served deserved better attendance. So did the bread, which, having only ordered dessert, we weren’t supposed to get. We watched with amusement as our server chased the mindless bread bearer in an attempt to divert the landing. He was a split second too late. The bread alighted. 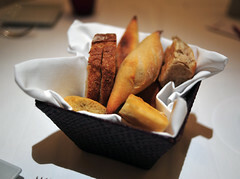 At miX, they serve a pretty basket of baguettes, focaccia-like bread with ham and roasted tomatoes (it tasted like pizza, Cowboy aptly observed), walnut and (golden) raisin rolls (my favorite), and sesame-coated whole wheat bread slices. The bread arrived with two butters – one salted and the other one a sweetened butter chunky with chopped peanuts, a fancy peanut butter. The all-white interior of miX is modern with a hint of retro. I imagine that the restaurant can be quite festive when full. Empty, it seemed hollow, cavernous even – especially with the driving beat from the club echoing around the chamber with palpable effect. Then-Executive Chef Bruno Davaillon left miX shortly after my visit, taking up the post as the executive chef of The Mansion on Turtle Creek, which I had visited in July of 2008 under John Tesar. Today, Leslie Brenner of the Dallas Morning News awarded Davaillon and The Mansion on Turtle Creek a glowing five-star review. CLICK HERE to see all of the photos from our visit. *Ducasse’s baba is done in a traditional baba mold – cork-shaped. The ones at Paul Bocuse were more like a round bun. I found a recipe for Ducasse’s baba and it worked magnificently. ** When the server arrived with the dessert, the strip of pineapple slid off the ice cream bench, toppling over. I was a little surprised that he served it anyway. After setting the plate down, he offered to take it back and replate it. But that offer was just lip service as he didn’t stay around long enough to allow us to respond. We slid the pineapple back on to the ice cream, a simple solution. ~ by ulterior epicure on March 15, 2010. I too had the Baba there, it was quite tasty. The food was actually quite good and they allowed a substantial amount of customization to the tasting menu. The view, as you noted, is superb – but the night we were there the DJ was mixing “Stayin Alive” by the Bee Gee’s with 50-Cent’s “In Tha Club” – it was painful both in concept and in volume.